That question is not easily answered, if answered at all. But let us examine the evidence before us. Firstly, the important thing to remember is that this cast announcement is of the principal cast, with confirmation from LucasFilm that more announcements will be made. For example, there will no doubt be numerous supporting roles to fill, for this is the epic universe of the Star Wars saga. So, with reference to the above alphabetized grumbles, I feel quite sure there will be more of a) and that b) will be an ongoing consideration. Growing up, the sometime rogue-cardshark-turned-administrator-turned-general-and-hero-of-the-rebellion that is Lando Calrissian was one of my favourite characters. From a young mind’s point of view, he quite simply had some of the best action figures. The original Kenner line in the early eighties released a Bespin Governor Lando figure, all in blue shades with a plastic cape. This was followed for Return of the Jedi with Lando in ‘Skiff Guard Disguise’ complete with nifty helmet. Post-film release, Kenner brought out a ‘General Pilot’ Lando, as seen in the latter stages of Jedi, where he commands the Millennium Falcon. This figure had a nylon cape, an upgrade from the plastic sheeting for sure. 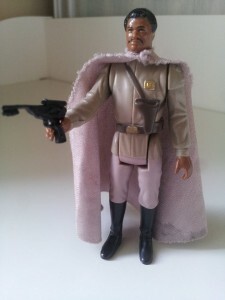 My prized Lando Calrissian “General Pilot” figure, from the mid-80s. HANDS OFF! Bill Dee Williams (born William December Williams Jnr) was already an established star by the time he was cast in Empire, having appeared in a number of critically acclaimed and academy award-nominated pictures. He was gifted with a character of dubious morality; greeting his old pal, Han Solo, with humour and hugs, it is not long before he has sold him out to Darth Vader (admittedly to keep Bespin Cloud City out of the clutches of the Empire). When Vader reneges on their deal, Lando reveals his honourable streak and attempts to make right his betrayal, and rescues Leia and Chewbacca, but is too late to save Han from being frozen in carbonite, now the prize of the bounty hunter, Boba Fett. Lando is then later revealed to now be the cooler-than-ice General Calrissian, and gets to command his old ship, the Millennium Falcon, alongside bizarre alien co-pilot Nien Nunb, at the fore of the fleet sent to attack the second Death Star. I’m not going to entertain idle gossip by speculating as to why Billy Dee Williams hasn’t been announced as part of the Episode VII cast. Idle gossip won’t answer my original question. But I will put forward a theory. Kasdan, as you may or may not know, co-wrote The Empire Strikes Back, coming in to assist Leigh Brackett, and also wrote Return of the Jedi. 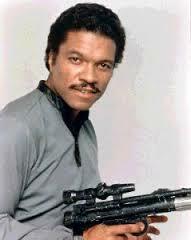 Both films feature Lando Calrissian in prominent supporting roles. If any writer on the planet is aware of Lando’s appeal/usefulness as a character, it is Lawrence Kasdan. Therefore, I take some comfort in the fact that if Lando doesn’t feature it may well be for a good narrative reason that Kasdan and J.J. Abrams have considered carefully. Personally, I think Lando will feature at some point, perhaps in a small role somewhere in the new trilogy. Internet rumours were suggesting that John Boyega, confirmed as one of the cast, would be playing Lando’s son, but this appears to stem from the fact that he is the only black actor cast thus far. Billy Dee Williams, on at least one occasion, has said that his favoured storyline for the Calrissians would be for Lando’s offspring to become a Jedi(s). Time and Kasdan’s script will tell all, but I’m not banking on it. I suspect Boyega will be a young Jedi but I think it unlikely he will be a Calrissian. If he is, then it may be a neat way of not including Lando at all. On the subject of the new cast, the actors confirmed so far seem a good, diverse mix, ranging from the original films (bar Lando of course), a smattering of recognizable faces (Andy Serkis, Max Von Sydow, Oscar Isaac, Domnhall Gleeson), to relative unknowns (Adam Driver and Daisy Ridley). Of course, it is hard to speculate as to whether this is good casting until we have a better idea of who is playing who, or what. For example, will Serkis be up to his mo-capped escapades once more, in what is likely to be a creature/effects-heavy production, or will we see his face on screen? Perhaps a bit of both, I dare say. 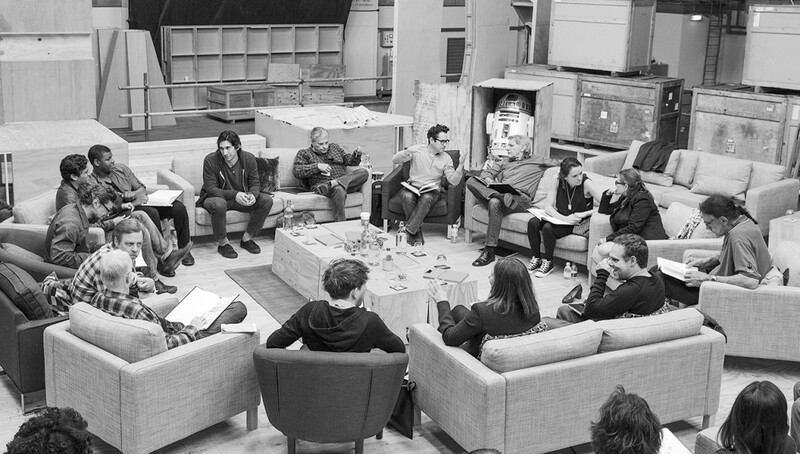 THAT photo, confirming the new cast for Star Wars: Episode VII. BUT where is Lando? I have a theory that maybe the antagonist in this new SW may well have been referenced in Episode III, about halfway through the film, in the scene where Chancellor Palpatine is telling Anakin the story of “the Sith legend of Darth Plagueis the Wise”, who according to Palpatine was a Sith Lord who had mastered the Midichlorians making him able to create life, and prevent death. Of course, Palpatine is playing upon Anakin’s concerns over his vision of Padme’s death, and like the dolt he is Anakin plays right into his hands and ultimately ends up being responsible for Padme’s death. What a wally. Anyway, Palpatine infers that this Sith Lord is dead (and it is later revealed by Palpatine that he murdered Plagueis), but if Plagueis truly conquered death, then, well, he might be up and around and needing some vengeance…. Yes, that is the sound of geek straws being scratched through. Come what may, the prospect of a new Star Wars film on the horizon is damn exciting and, for me, eclipses all of the comic book movies in the world, ever. Two of these standalone movies have been confirmed thus far, and rumours have circulated that these will be origin movies, focusing possibly on Han Solo, and/or Boba Fett, and/or Yoda. Given Edwards quote after the announcement, perhaps he is more interested in the Rebel Alliance period SW; that would hold more potential than a character piece, I think. Now, it is great that Star Wars is getting this upsurge, and I am very excited about seeing the old characters of Luke, Han and Leia back on the big screen (Lando would complete it, of course), and taking my children along to revel in the all-round awesomeness of SW but I am concerned that these standalone pictures will fall flat. There is definitely room for more great Star Wars movies in the world – but definitely not any more rubbish ones.